Steve Asmussen, one of the world’s most accomplished Thoroughbred trainers, watched his undefeated filly My Miss Aurelia win the gr. 2 Adirondack Stakes from a spot on the rail among the free tee-shirt people. 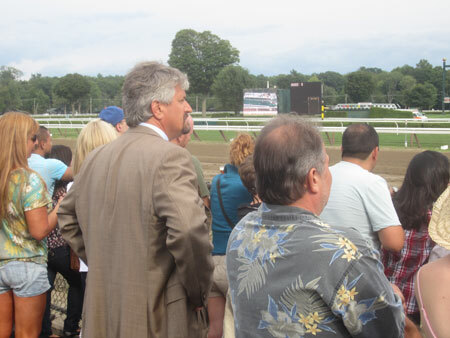 It’s not often that fans who take in the races from the grandstand apron see a tall, handsome gentleman dressed in proper-fitting plaid suit and white shirt and tie among them, and it’s likely, that most didn’t realize who that man was. Caption: Trainer Steve Asmussen watches My Miss Aurelia capture the gr. 2 Adirondack Stakes from the grandstand rail. It’s likely also that Asmussen couldn’t see My Miss Aurelia cross the finish line a neck in front of Millionreasonswhy from his vantage point. Once the two fillies swept nearly mirrored past the eighth pole where he stood, Asmussen watched the last part of the stretch run on the infield video messenging board. After the crowd ended their cheering, he sprinted quickly to the winner’s circle, joined by his children, nattily clad also in suit coats, about half way en route. “I think she showed a lot, especially the way the race set up,” Asmussen said afterward. “She was challenged the whole way,” he added. Every horse in the race took a run at My Miss Aurelia. None was able to match her for long. She and Millionreasonswhy were responsible for the meet’s most impressive performance by two-year-olds. By the way, Todd Pletcher didn’t saddle a runner in the Adirondack. Speaking of Pletcher, he did saddle Stopshoppingmaria, a daughter of More Than Ready, for Repole Stable to win the seventh race, a six-furlong maiden sprint for two-year-old fillies. There’s no doubt that the talented Stopshoppingmaria would have run in the Adirondack had she had won her initial start, a third place finish to My Miss Aurelia. Fingers are crossed that both horses as well as Millionreasonswhy will meet in the Spinaway. Julien Leparoux rode three winners. Yet even his most ardent supporters have their doubts about the validity of one. Several runners caused a charging Won Fast Bullet to check hard with a couple hundred yards to go, thus impeding his forward motion, before the end of the fourth race. Truelee Scrappin, the winner, had clear sailing while Won Fast Bullet, the show horse, did not. 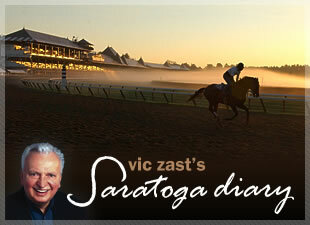 Saratoga Racecourse beat the weather. The weather service called for a 40 percent chance of showers at post time. There was a 70 percent chance at 3:00 pm and 80 percent by 6:00 pm. It stayed dry throughout the afternoon and the turf races remained on the surface for which they were written. The rain finally came at 9:30 pm. 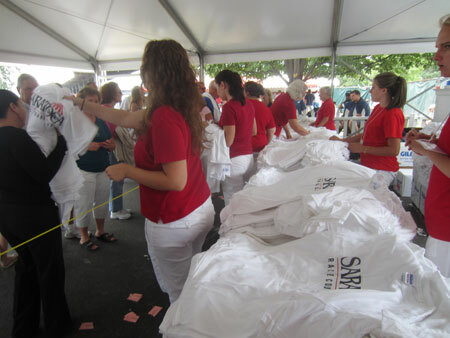 Caption: NYRA staffers dispense Saratoga 2011 tee-shirts to fans as Sunday's free giveaway. A white cotton short-sleeved tee-shirt with black and red type, including the year (2011), was the meet’s second giveaway. You can buy on Ebay.